There are many reasons why I reject panentheism, but in this post I want to mention just one. Panentheism comes from the Greek words for ‘all’, ‘in’, and ‘God’ — literally, “all-in-God-ism”. On this view, God is neither fully distinct from the universe (as in classical theism) nor identical with the universe (as in pantheism). Instead, the universe exists ‘in’ or ‘within’ God. The prepositions ‘in’ and ‘within’ are obviously not meant in a spatial sense (as in “Bob is in the kitchen”). Rather, they’re meant to capture the idea of ontological containment. God pervades and encompasses the universe in such an intimate fashion that there is an overlap or intersection between the being of God and the being of the universe. While God is more than the universe, there is no clear ontological distinction between God and the universe (which includes us, of course). It’s not difficult to see the attractions of a panentheistic view of God. Who wouldn’t like to imagine that they’re within God — that their soul participates in the divine? Who wouldn’t like to think that — to put it somewhat crudely — they’re part of God? Such a view can do wonders for your self-esteem! (On the other hand, if you already have high self-esteem, panentheism nicely validates it.) Likewise, panentheism is convenient for legitimizing your lifestyle choices, whatever they happen to be. If it’s good enough for God, it’s good enough for me — and since it’s good enough for me, it must be good enough for God! Despite these practical benefits, however, it seems to me that panentheism has a fundamental metaphysical flaw. According to biblical theism, God created the universe out of nothing and is ontologically distinct from it. There is a clean Creator-creation distinction. Moreover, God is not merely good (as though God were being judged by some external standard of goodness) but is goodness itself. God is the Absolute Good, the ultimate standard by which any other good is judged to be good. God is the norm and the universe is the normed (i.e., that which is subject to and judged by the norm). To use the classical categories, God is the Good, the True, and the Beautiful — originally, perfectly, and normatively. The universe is merely good (in part), true (in part), and beautiful (in part). For the panentheist, however, matters must be very different indeed. Since the universe is in God, insofar as there is good in the universe there must be good in God. So far, so good — so to speak. But by the very same token, insofar as there is evil in the universe there must be evil in God. If the universe is a mixture of good and evil (which I take to be an obvious truth) then God must also be a mixture of good and evil, on the supposition that God contains the universe. Whatever pollutes the universe unavoidably pollutes God, on account of the ontological overlap between God and the universe. It follows that God cannot be the Absolute Good. If the panentheist takes seriously the reality of evil, he ought to conclude that God is not pure goodness. But then God can’t be the ultimate standard of goodness. So who or what is? The answer must be: nothing. For that standard would have to be independent of God, yet the panentheist maintains that everything is in God (“all-in-God”). In short, the root problem with panentheism is that it conflates the norm and the normed. Consequently, the very distinction between good and evil is obliterated. When there is no Absolute Good, there is no good at all — and therefore no evil. Some may consider this line of argument simplistic. I grant that it’s simple, but that doesn’t mean it’s simplistic. The strongest philosophical arguments are often the simplest to state and to grasp. (Think of Descartes’ cogito ergo sum or Aristotle’s argument for the law of non-contradiction.) The basic logic of my argument is straightforward. Either the universe is ontologically distinct from God or it’s not. If it’s not, the problem raised above immediately arises. A lot more could be said, of course, but this will do for now. To summarize: one reason I’m a biblical theist rather than a panentheist is because I believe that there is an Absolute Good, that there is a real distinction between good and evil, and that there is real evil in the world. This entry was posted in Apologetics, Philosophy, Theology and tagged biblical theism, Christianity, Hare Krishna, Hinduism, panentheism, problem of evil, theism. Bookmark the permalink. I am trying to understand how god is unlimited if he doesn’t also include me in some way or another. What is the Mainstream Christian position on this? Does the bible say that god is specifically unlimited or omnipresent at any time, or is that just an assumption I am making? Or was this distinction of limitation that appears above a matter of later theology and therefore subject to improvement? The brief answer is that Christians don’t say that God is unlimited in every sense, but rather that God is unlimited in every sense affirmed by the Bible (either explicitly or implicitly). What this amounts to is the claim that God is unlimited in his perfections: his knowledge, his power, his goodness, etc. God cannot lie. God cannot sin. God cannot destroy himself. God cannot transform himself into a pineapple. Are those limitations? In some sense, yes; but not in any worrying sense. For these ‘limitations’ are entailed by his perfection. Similarly, if God included me or you, he would not be a perfect being. Assumptions (2) and (3) are mostly uncontroversial, although for (3) to hold weight, we need to be sure that gratuitous evil exists, and not merely non-gratuitous evil (think Leibniz and his “best of all possible worlds”). For the sake of argument, we can grant assumption (5), even though I am skeptical that a clear and distinct idea of the Absolute Good can be given. This means, if our inferences are valid, we must reject assumption (6) if we are to save panentheism from such an objection. Interestingly, panentheism implies a dualistic nature of God–one of transcendence and immanence. The immanent attributes include those applicable to the universe, namely Thought and Extension (following Spinoza). The transcendent attributes include those attributes applicable only to God, of which infinitely many exist, such as omniscience, omnipotence, omnibenevolence, atemporality, omnipresence, etc. For (6) to be true, it has to be true that finite properties can pose ontological threats to infinite properties. For instance, if God is both immanent and transcendent, then following (6), the temporality of the universe contradicts his eternality. But surely this is misleading. For it is a feature of panentheism and even Cartesian theism that the infinite is the unconditioned cause of the finite. And therefore the finite and its various modes and properties are not causally adequate to pose ontological threats (or logical contradictions) to the reality of the infinite and its various properties. For this reason, we see that (6) can be rejected on the basis of its conflating the ontological primacy of the Absolute Good with the purely contingent and accidental (accident as contrasted with substance) existence of evil. Thanks for the comment. Unfortunately, your formalization fails to capture my argument in several respects. First, God is not a set, therefore he cannot have a subset. Second, gratuitous evil is still evil. Whether or not evil is gratuitous is irrelevant to my argument. Third, my argument has nothing to do with “contradictory modes of being”. Rather, it has to do with the necessity and nature of norms. If X is a mixture of good and evil then there must be some norm of goodness with respect to which X is judged to be a mixture of good and evil (that is, the good judged to be good and the evil judged to be evil). X itself cannot be that norm, because X conforms perfectly to X (in other words, if X were the norm then X would be all good). So the norm must be external to X. Hence the problem for the panentheist. Either there is nothing external to X (in which case, there is no norm) or there is something external to X with respect to which X is judged (which seems to conflict with panentheism). Well, this is rather begging the question — to a panenthiest viewpoint, (as I understand it), God does have different elements, and therefore using a set-theoretical model seems utterly appropriate. Save that many arguments permitting the existence of evil in the face of the classic omni* characteristics work equally well in an panenthiest structure — Leibniz’s, as cited above, or any of the varied “The divine works in mysterious ways”. If X is a mixture of good and evil then there must be some norm of goodness with respect to which X is judged to be a mixture of good and evil (that is, the good judged to be good and the evil judged to be evil). The linguistic structure here also rather implies the existence of an external judge — which is again coloring your thinking. So the norm must be external to X. Hence the problem for the panentheist. Either there is nothing external to X (in which case, there is no norm) or there is something external to X with respect to which X is judged (which seems to conflict with panentheism). So what is the thing external to God by which God’s ultimate goodness is judged? That way lies, I fear, an infinite regress, which one can only define one’s way out of — a path equally available to the classical theist and the panentheist. Since you’re not commenting on Sudduth, and in fact not citing the words of any particular panentheist, all we have is your reconstruction of panentheism and the religious inferences you have drawn therefrom. Since you say you are a biblical theist rather than a panentheist, it would be good to have your interpretation of Acts 17:28 — ἐν αὐτῷ . . . καὶ ἐσμέν — which at least prima facie supports a panentheistic understanding of the creator-creature relationship. 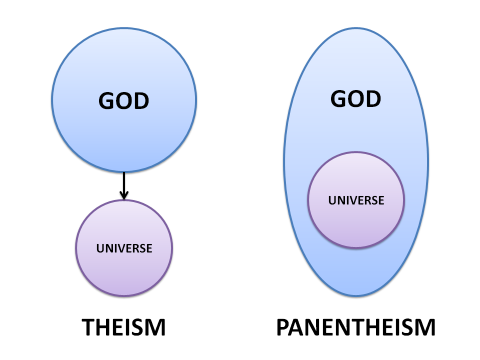 “Panentheism” is a constructed word composed of the English equivalents of the Greek terms “pan”, meaning all, “en”, meaning in, and “theism”, meaning God. Panentheism understands God and the world to be inter-related with the world being in God and God being in the world. It offers an increasingly popular alternative to traditional theism and pantheism. Panentheism seeks to avoid both isolating God from the world as traditional theism often does and identifying God with the world as pantheism does. I believe that panentheism understood along such lines is vulnerable to the argument I gave. As for Acts 17:28, that would only support panentheism if we ignored everything else we know about the apostle Paul. Fair enough, James, you did cite Sudduth, after saying you weren’t going to comment on his conversion testimony, which made me forget about Sudduth. You certainly did not present whatever case for panentheism Sudduth might have, but just his bare affirmation, the point of departure for your argument. My brief note — not reflective of my appreciation of your work — was a reaction to how you went about critiquing panentheism. The dominant impression I have of your post is that of holding up a strawman to ridicule. I charitably assume I have misunderstood you. After announcing your topic, you offered a possible moral-psychological motivation for adopting panentheism, which speculation sheds no light on panentheism’s philosophical merits or demerits and appears, at least to me, to walkup to the line of ad hominem. You then offered more of an observation than an argument: panentheism is incompatible with a certain philosophically sophisticated interpretation of the orthodox Christian doctrine of God. This is the point at which I wished you had cited the words of a panentheistic philosopher who claims to share that commitment and rejects the heretical inferences you drew from it. You told another commenter that you were not addressing the claims of Hartshorne or Cobb. So then what orthodox Christian panentheist do you have in mind? Eastern Orthodoxy affirms a panentheism in addition to the creator-creature distinction. They apparently feel that the imperative to affirm the “containment” of the creation by the creator is worth the slight risk of being misunderstood about their ontological disparity. But perhaps the Orthodox are not orthodox in your view. No, the world is not in God the way Bob is in the kitchen, but perhaps that spatial “in” reflects a relation internal to God. That is, perhaps God is the archetype of one entity’s being “in” another of which Bob’s being in the kitchen is one pedestrian ectype. As for your argument from evil, if evil is privatio boni, it is hard to see how the evil of the world could pollute being of God. You did not think to give this (at least time-honored) philosophical suggestion the dignity of a refutation. My claim of prima facie support in Paul for panentheism is weak, but it is not nothing. It is prima facie, that is, at first sight. Perhaps a full-orbed theology of Paul would defeat that superficial impression. But when the question of panentheism is up for discussion and I recall Acts 17:28 (already cited) or Colossians 1:17 (τὰ πάντα ἐν αὐτῷ συνέστηκεν) ” . . . in Him all things hold together or 1 Cor. 15:28″ (ἵνα ᾖ ὁ θεὸς τὰ πάντα ἐν πᾶσιν) “That He may be all in all,” I see three potential challenges in Paul’s writings to a dogmatic rejection of panentheism. Yet it didn’t occur to you to cite even one these verses (that are, of course, familiar to you). Under the circumstances (the limited ones of a blog post), to suggest that “everything else we know about Paul” rules out panentheism appears to beg the question. Because you didn’t cite any of those verses, I’m left to my own speculations, perhaps as annoying to you as your speculations about panentheistic motivation are to me. With the understanding that I don’t want to put words in your mouth, please consider this impression: in addition to a theology that you sincerely believe is based on Scripture, you have a philosophy that articulates that theology. Verses that prima facie seem to go against the articulation must, it seems, be interpreted in such a way as to conform to it. The rest of your post is virtually a confessio fidei: pious, but not germane. Are you this rude and condescending to everyone you disagree with, or am I receiving special treatment? I didn’t have any orthodox Christian panentheist in mind, because (1) as I reminded the commentator you mentioned, I had Eastern religious traditions primarily in mind, and (2) there’s no such thing as an orthodox Christian panentheist. Panentheism is inconsistent with the Nicene Creed, for starters. Apparently you’re upset because I didn’t offer an in-depth evaluation of your favored version of panentheism and I didn’t address all the issues you would have liked me to address. I’m sorry to have disappointed you. But if that’s your general approach to blog posts, I fear you must suffer a lot of disappointment. I gave a fairly typical characterization of panentheism and presented an argument against it. If you want to define panentheism differently, you’re welcome to do so. But that’s not addressing my argument. As for the privation theory of evil, let me dignify your suggestion with a brief refutation. Either evil (on the privation theory) pollutes the world or it doesn’t. If it does, then it also pollutes God if the world is part of God. In other words, the idea that evil is a privatio boni doesn’t render God immune from evil any more than it renders the world immune from evil. On the other hand, if evil (on the privation theory) doesn’t pollute the world, then so much the worse for the privation theory. The rest of your post is virtually a confessio fidei . . .
You really don’t seem to understand panentheism. If you were going to address a subject like this, one would think you’d engage the prevailing thinkers of the day who espouse and argue for the idea. Your ‘model’ of panentheism is nothing like the panentheism of John Cobb Jr or Charles Hartsorne, or John Haught or any of the most prominent panentheistic thinkers of our day. Panentheists make a qualitative, not quantitative distinction between God and the universe. Their position is very much like the idea of Divine Personalism, espoused as far back as the Book of the Wisdom of Solomon. There are different models you have to use simultaneously to capture what panentheists are talking about. One is a mother/womb analogy and another is a mind/body analogy. God’s character is perfectly good, and that character conditions the universe but doesn’t determine it. We can distinguish between the mind and the body without thinking them completely separate. A womb is within a mother, but we can make a distinction between a mother and the womb she contains. (What happens to the baby doesn’t necessarily ‘happen’ to the mother, though it affects the mother). For your argument to work, it would have to be true that whatever is within a being is constitutive of that being (a bacteria is within me, but isn’t part of what makes me up). By your logic, if a person has cancer that cancer somehow becomes reflective of that person’s character, or implies that a person doesn’t have control over who they are as a person. God’s mind and Spirit remain the ground of all that is good, and beautiful and ordered for that matter, even if it is true that the physical universe fails to perfectly reflect that goodness, or beauty, or order. God and the universe, for the panentheist do not form an UNDIFFERENTIATED unity. And the there are philosophical reasons for being attracted to panentheism, much more sophisticated than the one you give. If the universe and God are distinct, then how does the universe maintain itself? If self-sustained by some God-given power, then the universe becomes a lesser divine reality alongside God. If, on the other hand, the universe is sustained by some ongoing Divine Providential activity, then you have already admitted a connection between God and the universe that makes a strict distinction between them meaningless. Theologically, the reasons to accept panentheism are as simple as believing that God loves Creation. Love is in and of itself a self-expanding experience. It is including the object of your love in your sense of your self. Loving a being that is totally independent of you is senseless. Love IS, in part, the making of the object of your love a part of you. Panentheism is, on one level, simply accounting for the fact that God created a Universe He loves, out of love. Actually, I’m familiar with the panentheism of Hartshorne, Cobb, et al. But their process theologies are (obviously) not the focus of this post, which is primarily concerned with panentheism as it arises in Eastern religious traditions. I note that you haven’t said anything to refute the argument I gave. God and the universe, for the panentheist do not form an UNDIFFERENTIATED unity. Did I suggest otherwise? No, I actually distinguished between panentheism and pantheism. Furthermore, it’s hard to see how your analogies help your case. Take the mind/body analogy, for example. Yes, my mind is distinct from my body. But both are parts of me. So if we’re to take this analogy at face value, the universe is part of God — in which case, my argument does apply after all. On the other hand, if God only corresponds to the ‘mind’ part of the analogy, why adopt the label panentheism (“all-in-God”)? Either way, according to process theology God is dependent on the universe, in which case God is dependent on something that is partly evil. And the there are philosophical reasons for being attracted to panentheism, much more sophisticated than the one you give. I hoped it would be evident that the reasons I gave were offered somewhat tongue-in-cheek. I’m well aware of the philosophical arguments offered for process theism. But again, that wasn’t the focus of this post. I assume you do not think God has spatial extension and, thus, do not take “in God” to be a literal spatial reference. That being the case, I can see no prima facie support for panentheism, as Anderson has described it, in Acts 17:28 since I do not see what would indicate (at least prima facie) that “in God” means we share in the ontology of God. I’m not as well versed in philosophy as you. Perhaps you could help me understand your rejoinder at more of a layman’s level. By “ontological threat” do you mean something like “effect” or “indicate” something about the ontology of God? So God is not related to his finite properties? Or perhaps none of the “finite properties” are predicable of God (of his being or essence)? What is an “unconditioned cause” such that it supports your second sentence: the finite properties of God don’t “ontologically threaten” (whatever this means) the infinite properties. Perhaps because I do not understand exactly what you’re saying, but it seems like it would still be the case that God’s being contains evil. Correct? You just do not think this creates a problem with God being the “Absolute Good,” correct? 2. I don’t see how Acts 17 provides prima facie evidence for an affirmation of panentheism. First, even if the poet Paul cited meant it in an panentheistic sense, it doesn’t follow that Paul meant it similarly. Second, as there are various meanings of “in him,” not all of which are identical to a panentheistic interpretation, on what basis is it assumed that “in him” is to be even prima facie read panentheistically? Moreover, why assume the Greek for “in” is being used according to mordern, English connotations? Third, the statement the statement is consistent with divine conservation and the divine interpenetration of all things where this interpenetration is not symmetrical, i.e., x interpenetrates y but y does not interpenetrate x. But, at least according to the SEP entry on panentheism, the penetration seems symmetrical, viz., “Panentheism understands God and the world to be inter-related with the world being in God and God being in the world.” On the related point, we live and move *by* the power of God, i.e., By him we live and move and have our being (there’s commentors who support this as the first-century meaning of the term). Fourth, Paul makes other statements along with the one you cite, such as being God’s offspring and also about the impropriety of thinking God is like gold, silver, or stone. But if we must assume a prima facie panetheistic understanding, why *wouldn’t* we assume the divine being is like these things; and, why *would* we assume that we’re God’s “offspring?” It’s not *prima facie* clear that these things fit perfectly on assumptions of panentheism. Indeed, at a minimum I’d be inclined to think prima facially *otherwise*. Hi, interesting post, but I have doubts (about the incompatibility of panentheism and evil, not your not being a panentheist!). Specifically, I don’t see how panentheism is more apt to fail on account of the problem of evil than a more ‘standard’ theism might be. If the standard theistic God (TG) creates the world (including us humans) with a capacity to commit evil acts (which I take freedom of the will must allow) and has full knowledge that we will do so, then TG is at least somewhat responsible for our abuse of that will – like if I were to hand a loaded hand-gun to a toddler. Now, Augustine argued that TG is not responsible for evil acts (I’m sure we’re all familiar with the broad strokes of his argument) nor for ‘natural’ evil, which is merely a defect of our perception of the world. 1. Why couldn’t an Augustinian argument be applied equally well to a panentheistic world, such that there is no evil in the world except that we see it that way (and other adaptations of his doctrine)? 2. Just what do you mean in saying that there is both good and evil in the universe? This borders on heresy, from what I understand as the traditional Christian doctrine. On 1. The Augustinian position isn’t that there is no evil, we only see the world that way. It’s that evil is a deprivation. It’s a lack or failure for the created thing to be rightly ordered with respect to God, the creature him/herself, and creation in general. Now, it seems as if Vaishnavism has some sort of conception of salvation, being release from the cycle of reincarnation of some such “answer” to man’s woes. So that would seem to say that there’s some disorder or normatively conceived failure on man’s part, and this would be part of God. And that would bring us back to James’ criticism. So adopting this move wouldn’t, as I can see, help. 2. That there is evil in the universe is a foundational stone in the story of Christianity. No evil, no sin, so need for Jesus to save us from our sin. Clearly, there’s good in our universe too. Jesus dying for his people and accomplishing the work of salvation for them so that they do not need to work, whether by good works, chanting, meditation, cycles of reincarnation, etc., for their salvation. Rather, someone else did the work required *for them*. This is an example of a good in our universe. Both are taught in Christian theology, and so are not heretical. James, replying to you this time is tricky, because you’ve introduced into the discussion the ethics of discourse, which would seem to counsel that one offers evidence of alleged rudeness and condescension, not a sarcastic rhetorical question masking a gratuitous assertion. But let me try. First, if I offended, I apologize. Any offense was, I assure you, an unintended consequence of my doubts about your project of refuting panentheism within the ambit of a blog post. I benefited from your and Greg Welty’s “The Lord of Non-Contradiction,” and expect to do so from your other writings, so I’m sorry that our first interaction has gotten off on the wrong foot, so to speak. Second, a Christian philosophical theologian who wishes to explain why he’s not a panentheist – simpliciter –but trains his attention on one theologically distasteful (apparent) implication of a non-Christian version potentially misleads his audience. This is not a matter, as you suggest, of our defining “panentheism” differently, but of charitably being open to the possibility that orthodox Christians can affirm both the Nicene Creed and a panentheistic understanding of the creator-creature relationship without being guilty of besmirching God’s holiness. Your denial to the contrary notwithstanding, there are orthodox Christians who describe themselves as panentheists. For example, the Eastern Orthodox, mentioned in my previous message but not acknowledged by you. They accept the Nicene Creed (pre-filioque version, of course). Perhaps you think that they are not orthodox, or are inconsistent, or are abusing language, or something else, but you have not told us. The attitude, “If it’s good enough for God, it’s good enough for me — and since it’s good enough for me, it must be good enough for God!,” does not fairly characterize them. Third, I am not “upset” (there you go psychologizing your philosophical adversary again) because you didn’t “offer an in-depth evaluation” of my “favored version of panentheism,” but now that you’ve brought up the latter, I cannot resist, for by contrast it shows how you’ve trivialized what you purport to critique. On a panexperientialist metaphysics, God experiences – not merely contemplates at a safe distance – His creatures, which are, at the basic level, also subjects of (at least rudimentary) experience, and they all experience God. Experience provides a non-spatial model for understanding how one entity can be “in” another – even how one Divine Person can be in Another – which is most assuredly not like Bob’s being in the kitchen. Neither is it a mereological (whole and its parts) affair (or set and subsets), on which your putative refutation trades. According to this panexperientialist model, God has judged and redeemed the fallen creation that He experiences, but its fallenness does not demote Him metaphysically in any way. It does not “pollute” Him, to use your descriptor, or derange Him. He knows His creation from the inside as well as from the outside. We enjoy the good and suffer evil, and so does God, He does so but eminently. Now we cannot debate this in a combox, of course, but I hope you will agree that in addressing your argument I have made my problems with your argument clearer. Finally, if we (and the rest of creation) may look forward to partaking of the divine nature (2 Pet 1:4; see also Rom 8:22) without becoming the Trinity, then there is a respectably orthodox Christian sense according to which we may affirm that all that is other than God can (and one day will) be in God. Your denials of this possibility, occluding the prima facie scriptural evidence I adduced to that effect, beg the question. Maybe what you were attempting deserves a paper, not a post. It should go without saying, but unfortunately doesn’t: I may not have been sparing in my criticism, but it was directed at your arguments, not at you personally. If you think otherwise, then please cite particulars. And I would appreciate it if you would keep that norm in mind when you reply. charitably being open to the possibility that orthodox Christians can affirm both the Nicene Creed and a panentheistic understanding of the creator-creature relationship without being guilty of besmirching God’s holiness. Since Christianity is not a philosophical buffet, this is just a nonsensical suggestion. There is nothing charitable about being open to redefining Christianity to include outright heresies. On the contrary, it is shameful. As James rightly points out, an orthodox Christian panentheist is a contradiction in terms. I think James would agree with me in saying that even if it is possible for Eastern Orthodox to be Christians, they are certainly not orthodox ones (the name notwithstanding). To my knowledge, Eastern Orthodoxy, like Roman Catholicism, denies sola fide, which is a foundational doctrine of the gospel. Thus, Eastern Orthodoxy is not Christianity, but a Christian cult. Mormons and Jehovah’s Witnesses also call themselves Christians—doesn’t mean they are. Finally, if we (and the rest of creation) may look forward to partaking of the divine nature (2 Pet 1:4; see also Rom 8:22) without becoming the Trinity, then there is a respectably orthodox Christian sense according to which we may affirm that all that is other than God can (and one day will) be in God. Only by begging the question in favor of panentheism and interpreting “partaking” to mean something ontological, rather than something eschatalogical as Paul and Peter intended. I wasn’t offended. But I can’t deny that your tone disinclines me from continuing our exchange. Perhaps this is just your style of discourse and I need to get used to it. Still, it’s not “psychologizing” to infer that a person is upset from the fact that they sound upset. Anyway, let us move on. I consider you a serious and thoughtful interlocutor, and I want to take your position seriously. (A) Whether panentheism has biblical support. (B) Whether panentheism is consistent with orthodox Christianity. (C) Whether some forms of panentheism avoid the objection I originally raised. (A) and (B) are worthy of discussion, but they’re tangential to my concerns here and I’m not really interested in pursuing them at this time. Regarding (B), we’ll just have to agree to disagree, because apparently we’re working with different criteria as to what counts as orthodox. You take the panentheism of some Eastern Orthodox theologians as evidence of panentheism’s compatibility with Christian orthodoxy. I take it as evidence of the deviation of some Eastern Orthodox theologians from Christian orthodoxy. This is not a disagreement that can be settled easily. By the way, it’s not so clear to me that the Eastern Orthodox you have in mind are panentheists. I’ve always understood panentheism to deny the ex nihilo creation of the universe by God. If you understand panentheism differently, that’s likely part of the explanation for our disagreements. Now, turning to more pertinent matters, I thank you for obliging me with a summary of a form of panentheism (as you take it to be) that you think evades my critique. You have indeed engaged my argument and I appreciate that. On a panexperientialist metaphysics, God experiences — not merely contemplates at a safe distance — His creatures, which are, at the basic level, also subjects of (at least rudimentary) experience, and they all experience God. . . . He knows His creation from the inside as well as from the outside. We enjoy the good and suffer evil, and so does God, He does so but eminently. (P1) God experiences his creatures and his creatures experience God. (P2) The experiences of God’s creatures are also God’s experiences. As I see it, P1 is compatible with at least some forms of theism. That’s to say, I don’t view it as distinctively panentheist and thus I don’t consider it to fall within the purview of my critique. In that case, we’ve been talking past each other. P2, on the other hand, seems to imply the sort of ontological overlap that I criticized in my post. I cannot see how X and Y could have the same experiences (and I mean numerical sameness) without sharing the same mind, at least in part. But in that case, my critique seems to apply after all, insofar as our minds are polluted by sin. It’s not merely the case that I suffer evil and consequently God suffers evil too. It’s also the case that I have evil thoughts (which I do!) and consequently God has evil thoughts too. Let me finish on a conciliatory note. I’ll be more than happy to concede that on your understanding of panentheism, there may be forms of panentheism to which my objection does not apply, if you’ll concede that the definition I used isn’t idiosyncratic (even if it doesn’t align with yours) and that there are prominent forms of panentheism to which my objection does indeed apply. Deal? Deal, James. This is the kind of nuanced disagreement I was seeking. Again, I apologize if my tone delayed it. (I still fail to see, as do others I’ve shown my initial comments to, that my tone was “rude and condescending,” but one of those others suggested that my style might strike some as “harsh.” http://dgmyers.blogspot.com/2009/08/harsh-style.html) Your definition of panentheism isn’t idiosyncratic, and your criticism doesn’t apply to every position its adherent would describe as panentheism. A few comments on your (P2): I deny a numerical identity between my experience and God’s, but affirm a qualitative identity, which I believe is an entailment of God’s omniscience (except on an epistemology that models knowledge on a subject’s sheer contemplation of an external object). In that qualified sense of “in,” if what’s in S’s experience is in S, then, if all of creation is within God’s experience, without ontological remainder, then all of creation is in God. Creation has no non-experienced “residue” subsequent to its being experienced by God. God is not, however, the agent of my actions, and therefore is not the author of sin. God does not, for example, sneeze my sneeze. God does, however, perfectly and exhaustively experience with perfect accuracy the qualities of my experiences, regardless of their moral quality. God enjoys, and suffers with, His creation. He is perfectly sympathetic to all His creatures. Among the six things that the Lord hates (Prov 6:16-19) is a heart that devises evil plans. How does God know that heart? Not by reading about it in a manual of moral theology, of course, but by being repulsed by its reality. He knows the evil we plan and commit better than we do, but His attitude toward it is different. God’s revulsion is the effect of a causal chain whose proximate origin is in the creature (even if its ultimate origin is in God’s decree). His revulsion at our evil thoughts is not, however, a feeling that He “projects” onto us, as, say, a recovering alcoholic might “project” a negative feeling onto the bars he passes on the way home from work, but a reality that is communicated from the creature to the creator. He experientially knows the sinner’s perverse delight in his sin without His delighting in it Himself. Thanks for this helpful clarification. As I understand it, your position is compatible with the claim that there is (as I put it in my post) a clear ontological distinction between God and the universe. God’s being could be wholly distinct from the being of the universe, even if the universe is “within God’s experience” (in the sense you’ve explained). As such, I would sooner describe your position as a variety of theism (even if not classical theism) than a variety of panentheism. (Perhaps the left-hand diagram, modified to show a two-way arrow, would fit the bill!) If you prefer to describe it as panentheism, so be it. But it’s clear now that our disagreement (on this point) is merely semantic. I can appreciate the rationale for the position you take, even while I disagree with it. However, I need to move onto other things, so I’ll have to store away my objections for another day. Thanks for the interaction, the bumps and bruises notwithstanding. Apply that reasoning to God. It really doesn’t what one’s metaphysical view is, panentheist or otherwise. If God is, as you say, the ultimate standard for good, then nothing will affect that a priori truth. You are not finding a problem in panentheism such as to contradict God’s absolutely good standard. Rather, you are finding a problem in God’s absolutely good standard such as to contradict the notion of panentheism. It doesn’t matter where (ontologically) we place evil. God is always transcendental and unaffected. Paraprakrti, since the sun does not absorb anything, that doesn’t give us much confidence in the accuracy of anything “His Divine Grace” might have to say, does it? Also odd how he focuses on urine rather than…you know…rainwater or something. What is it about cult leaders and scatalogical obsessions? Mohammad was the same. All that said, it doesn’t seem you’ve interacted with James’s point at all. If God is a mixture of good and evil (as panentheism entails since God is ontologically one with creation in some sense) then God cannot be the source or norm for goodness. Even if the science of your analogy were accurate instead of embarrassingly uneducated, an analogy is not a substitute for an argument. Clearly, “absorb” means “evaporate” here, which is caused by the sun. But the details of the analogy aren’t so important. The point is that God is the ultimate standard of good. Hence, evil can’t touch God. Period. It isn’t odd that the “focus” is on urine in that analogy. It is odd, however, that you couldn’t think of a more intelligent response. “Urine” helps to drive home the point that “sun is still pure.” Rainwater doesn’t tend to have impure connotations as does urine. God isn’t a mixture of good and evil, God is the source or norm for goodness, and panentheism does not entail otherwise. Achintya bhedabheda tattva: God is simultaneously and inconceivably one and different from His energies. The material universe is a small portion of those energies, but evil therein is not an impurity for God in the same way that urine is not an impurity for the blazing sun. Hence, God remains the source or norm for goodness. The point is that God is the ultimate standard of good. Hence, evil can’t touch God. Period. Apply that reasoning to God. It really doesn’t what one’s metaphysical view is, panentheist or otherwise. If God is, as you say, the ultimate standard for good, then nothing will affect that a priori truth. This is a very strange argument. It seems to take the form, “If p is true then p couldn’t be inconsistent with some q, because then p would be false.” But that’s clearly an invalid form of argument and it begs the question in favor of panentheism. It doesn’t matter where (ontologically) we place evil. God is always transcendental and unaffected. So in your view, God is unaffected by evil — including human suffering. How is that consistent with any form of panentheism? In any case, once again, this begs the whole question. You have defined panentheism in your own way in which there is no ontological difference between God and ourselves. However, I know of no Eastern or Western form of panentheism that defines it so. Neither process theology, Eastern Orthodoxy, nor evangelical “open theism” (where arguably Christian panentheism is entertained) from the West, nor any form of Hindu Vedanta’s panentheism—dvaita, visistadvaita, dvaita dvaita, suddha dvaita, acintya behdabheda—embrace the idea that there is no ontological difference between that which is within the embrace of God and God—between ourselves and God. Arguably the part is as much different as it is one with the whole, especially when the sum of the parts do not constitute the whole. Your characterization of panentheism as a theological world view that is more readily ego inflating and supportive of any number of life style choices (presumably including those otherwise thought to be morally vacuous), is also not supported by any known form of panenthism, especially those of the East. There in Theistic Vedanta we find a strict moral code underlying a life of spiritual culture. This spiritual culture or practice involves systematic worship and the pursuit of grace arising out of a scripturally sound moral life, in the absence of which contemplative life is not permissible and genuine mediation is not possible. “If I were asked to choose one man in Indian religious history who best represents the pure spirit of devotional self-giving, I would choose the Vaishnavite saint Caitanya, whose full name in religion was Krishna Caitanya, or “Krishna consciousness.” Of all the aints in recorded history, East or West, he seems to me the supreme example of a soul carried away on a tide of ecstatic love of God. . . . Caitanya aroused in his followers a flood of passionate love of God. As a result, a wave of religious fervor swept over Bengal and Orissa. Yet despite the emotionalism his teachings brought about, he himself was extremely strict. He closely watched the morals of those who were around him, sternly reproving any form of self-indulgence. Though literally worshipped by thousands as Krishna himself, he led a simple and even austere life. Regarding your critique of panenthism in consideration of theodicy, this requires a much lengthier response. But I found your critique to be superficial at best, if not very misrepresentative of most forms of panentheism. The form that Michael has converted to, for example, acknowledges an Absolute Good, an ontological difference between God and humanity, and God and the world to name a few of the things you believe in but incorrectly think are exclusive to your particular form of biblical theology and not found in panentheism. And of course no theology to date has been able to satisfy all theists with regard to problem of the evil in the world and an all-good God. Thus I find your overall critique of panetheism on the one hand uninformed and on the other superficial. Your critique also appears to suffer from a Western bias. For when others have pointed to Western forms of panentheism, you have stated that you are speaking of Eastern panentheism. Perhaps you are doing so in the sense that you are addressing Michael’s embrace of it. However, you begin to do so only to veer off into your own definition of it. Your deflection of others who have pointed to Western, Christian panentheism implies, it would seem, that Eastern panetheism is significantly different from its Western counterpart and that it is Eastern panentheism that you are referring to. But given what you have written this does not hold up, nor is there any significant difference between Eastern and Western panentheism. Emerson-derived Christian Unitatarianism, for example, is very much inspired by Hindu panentheism. Hartshorne, who conjoined process theology with panentheism, maintained a lifelong membership in the Methodist church but was also a Unitarian. Thanks for taking the time to come here and comment. But frankly there’s so much wrong with what you’ve written that I scarcely know where to begin. Panentheism is the view that the universe is God, though God is more than the universe. It should be clearly distinguished from pantheism, in which God and the universe are strictly identical. For the panentheist God has an identity of his own, that is, he is something which the universe is not. On the other hand, the universe is part of the reality of God. It is God. Source: New Dictionary of Theology, Inter-Varsity Press, 1988. “Panentheism” is an appropriate term for the view that deity is in some real aspect distinguishable from and independent of any and all relative items, and yet, taken as an actual whole, includes all relative items. Source: Charles Hartshorne, The Divine Relativity, Yale University Press, 1948, p. 89. “One who knows God knows that the impersonal conception and personal conception are simultaneously present in everything and that there is no contradiction. Therefore Lord Caitanya established His sublime doctrine: acintya bheda-and-abheda-tattva — simultaneous oneness and difference.” (A. C. Bhaktivedanta Swami Prabhupada) The analogy often used as an explanation in this context in the relationship between the Sun and the Sunshine. For example both the sun and sunshine are part of the same reality, but there is a great difference between having a beam of sunshine in your room, and being in close proximity to the sun itself. Qualitatively the Sun and the Sunshine are not different, but as quantities they are very different. This analogy is applied to the living beings and God — the Jiva being of a similar quality to the Supreme being, but not sharing the qualities to an infinite extent, as would the Personality of Godhead himself. Thus there is a difference between the souls and the Supreme Lord. I maintain that panentheism, understood in accordance with any of these definitions, is vulnerable to my critique. Perhaps you should take up your concerns with the authors of these quotes, rather than with me. In any case, what’s fascinating to me is that for all the wailing about my definition of panentheism, none of the defenders of panentheism who have commented here have actually engaged with the specifics of my argument. What I want to know is: (1) how does your version of panentheism escape my critique and (2) how is your version of panentheism actually worthy of the name? You have defined panentheism in your own way in which there is no ontological difference between God and ourselves. No, I didn’t. I carefully distinguished panentheism from pantheism, and I stated that according to panentheism “there is no clear ontological distinction between God and the universe” (emphasis added). I didn’t claim that there is no ontological difference at all. And it is uncharitable in the least to imply that Michael’s soul searching, through which he arrives at a form of panentheism, is really about nothing more than rationalizing self indulgence in the name of religion. I implied no such thing. Now who’s the one being uncharitable! Your critique also appears to suffer from a Western bias. I’ll be the first to admit my Western bias. But will you admit yours? Isn’t it the case that the religion you promote is really a diluted and sanitized form of Hinduism, trimmed and shrink-wrapped for Western consumption? Consider, for example, what some ex-Hindus (here and here) have to say about the matter. The form that Michael has converted to, for example, acknowledges an Absolute Good, an ontological difference between God and humanity, and God and the world to name a few of the things you believe in but incorrectly think are exclusive to your particular form of biblical theology and not found in panentheism. I’m happy to take your word for it. But that really doesn’t address my critique at all. My point is that the claim that there is an Absolute Good is inconsistent with other distinctive panentheist claims (claims which biblical theists deny). Thus I find your overall critique of panetheism on the one hand uninformed and on the other superficial. For all the above reasons, I find your critique of my critique to be both uninformed and superficial. My sense is that this is where the theological world is going. Maybe so, but that’s hardly evidence for its truth. As for Keith Ward, I’ve remarked on his unbiblical and unorthodox theology here. If you read it you will see that a clear ontological distinction between the soul (atman) and God (Paramatman) is acknowledged. You will also see that the problem of evil is also dealt with such that we end up with an all good God untouched by evil. At the same time, it may not be dealt with to your satisfaction, but then again classical theism does not deal with it to the satisfaction of the panentheist. So it may not be profitable to go down that road. Suffice to say that panentheism’s solution does not work for you and that you feel more comfortable with the solution offered in classical theism. If panentheism besmirches God with evil, classical theism leaves him less that fully potent in its presence. And so the arguments go . . .
That leaves us with the first part of your critique: Panentheism lends itself to following one’s whims in the name of following God, because in panentheism there is no real difference between ourselves and God. Again, I see no evidence of this among serious adherents of well structured forms of panentheism, at least some of which do make a clear distinction between God and the individual soul. In your critique you maintain that in panentheism there is no clear ontological distinction between God and the rest of us. I included this critique of yours within your definition of the term and took excepetion to it. The distinction between soul and God in prominent forms of panentheism may not be clear to you, but it is to most panentheists. I claimed that in panentheism there is no clear ontological distinction between God and the universe. Pointing out that (some) panentheists believe there is a clear ontological distinction between God and the human soul doesn’t address the argument, because that claim is still consistent with the idea (characteristic of panentheism, so I maintain) that there is ontological overlap between the being of God and the being of the universe. It is the latter that gives rise to the problem discussed in my post. In light of the article you cited, let me ask you directly. Do you believe that the world is “God’s body” — that the world is part of God much as my body is a part of me? If so, your position is susceptible to my critique, and you have said nothing to refute it. Arguments from evil against theism is neither here nor there in this discussion. The question at hand is whether my argument against panentheism is cogent. A tu quoque isn’t a rebuttal. If according to one interpretation of Scripture the world is in God — in some respectable, non-Pickwickian sense of “in” — then the sufficient condition of “name-worthiness” has been met. The scriptures I cited bear a panentheistic interpretation, at least at first glance, and that is all I claimed for them. They represent the beginning, not the end, of a long argument. Those scriptures hardly prove panentheism, but the case for their panentheistic interpretation does merit a hearing. The summary denial of that merits is what begs the question. Escaping your critique requires but a specification of the central relationship. In a previous post (unanswered by you, which is your prerogative), I suggested that experience provides a model of “containment” unlike that of the Bob’s being in the kitchen’s. When two persons love each other, for example, they remain distinct from each other, and yet enter into each other’s very being. Literally, not metaphorically. God so loved the world, but not, as that pop song has it, “At a [Safe] Distance.” He loves eminently, and thereby sets Himself up to suffer eminently. As for your argument, whose force you imply that we “defenders” evade, it is worth belaboring the obvious: a person is not evil because he suffers evil. That is as true for a divine as it is for a human person. If a child is the victim of a crime, for example, he or she suffers another’s moral evil — which we do not then impute to the victim! The Fall of creation does not warrant imputing fallenness to the creator; on that we can agree: my point is that God does not theoretically contemplate the world, but feels it exhaustively. My answer may not meet with your confessionally correct approval, but you cannot say I have not offered one. Twice. On “containment,” it seems to me that some presentations of panentheism claim the “in” relationship is symmetrical. Would you agree with this? I frankly don’t see your understanding of “en” as sufficient enough or strong enough for panentheism. If I suffer an evil, I am not panentheistically related to that evil; and, if I am, than you’ve made ‘panentheism’ an uninteresting term—perhaps even a deist, a sufficiently crafty enough one—could count as a panentheist. However you judge my policy, as it were, it holds for you as well as for Bnonn. If James’ policy is not to respond further, then that’s the end of that, without prejudice to his position. The evil in the universe doesn’t exist in the same way that God exists. God constitutes the standard for existence and how it should be defined. The Bhagavad-Gita puts it succinctly when it states that that which exists is eternal (without beginning and without end.) There is not an eternal/absolute evil. And therefore evil “existing” within God makes no sense. Panentheism, as Vaisnavas understand it, pertains to God and His energies. The material universe consists of God’s energies and those energies are eternal and absolute, but the particular items manifest within it are fleeting and relative. And therefore evil “existing” within God makes no sense. Since your worldview entails that everything contingent exists within God, I’ll take that as an admission that your worldview makes no sense. Beat me to it, Bnonn. And I’ll take that as you failing to grasp my worldview. Our position is panentheistic so far as the relationship between God and God’s energies is concerned. Both God and God’s energies are absolute. Tony, no worries. I’m pointing out that it’s a bit silly to continue to yammer about the “prima facie” panentheistic force of Acts 17 when you have rebuttals to that very claim in this very thread. In fact, those rebuttals demand an intellectually honest person to refrain from making his claim about the prima facie meaning of the texts, or to refute them. What can’t and shouldn’t continue to happen is for you to go on and continue to make the same claim. You don’t need to respond. I didn’t ask for that. You need to drop the “prima facie” claim, though. I was just pointing that out. Thanks. You’re not welcome, Paul. Of course, I don’t “need to respond.” But apparently, I need to take you seriously when you lecture me about my “silly” “yammering” and what an intellectually honest person needs to. My argument is with James. Please respect that. Tony, your attitude is puzzling. If you’re having a debate with someone, and you make some claim to forward your argument…and an onlooker butts in and corrects you…it doesn’t matter if the interruption was unwelcome or not. You’ve still been corrected. You can’t just pretend the interruption didn’t happen and continue the debate by maintaining your claim in the teeth of evidence to the contrary. On what basis would you do that? The fact that your interlocuter himself didn’t bring up the point? But so what? It’s not as if facts rely for their force on the person who brings them up. I owe nothing to you or any other onlooking butter-in by way of reply, or by way of remedy for your perplexity, and my claim of lack of obligation has nothing to do with “pretending” that the butting-in didn’t occur. And I suppose we disagree about that. Tony, could you point me to where you think I suggested you owe me a reply? What I suggested was that now the “cat is out of the bag” as regards your mistake about Acts 17, it doesn’t matter that it wasn’t James who let it out. It’s still intellectually dishonest to carry on with him as if Whiskers were still snugly bundled up. A question (for example, “On what basis would you do that?” ) normally implies the expectation of a reply — the only sense of “owe” I meant — but there is nothing normal about your butting in, as you put it, after I declared the limits of my interest in participating (against my better judgment) in this free-for-all combox. I could say that I disagree with your judgment about what matters and about my alleged “mistake,” but that would suggest a higher interest in your thinking well of me than is the case. If your comrades at Triablogue would publish my response (submitted today) to their misrepresentation of what I’ve written on this page, at least some of your apparent curiosity would be satisfied. Tony, my question was rhetorical; it didn’t demand an answer. Apparently you’re unfamiliar with how blogs work. Perhaps you should confine your activities to another medium until you figure this out. There is “nothing normal” about a follower of James’s blog replying to a commenter on James’s blog? Really? Come now. Incidentally, the only time I can see where you declared the limits of your interest in participating was after I responded to you. And as Paul and I have both pointed out, the fact that you’re not interested in responding to us (though your actions say otherwise) does not maaaagically eliminate our corrections of your jejune reading of Acts 17. I am very much inclined to agree with James’s initial assessment of you. In your comments to me, you have been nothing but condescending and rude—not to mention just plain ignorant of the medium on which you’re presuming to have a discussion, along with unreasonably mulish about a very clear defeater to your argument. I had heard that you were a philosopher. Bill Valicella seems to hold you in some regard. Sadly, your actions here have proved otherwise. I guess even Bill can be wrong. Gee, Bnonn, why are you and Paul so put out that I don’t want to discuss panentheism with you, or debate the usefulness of NT verses that are, in my opinion, not proofs of panentheism, but rather support a (defeasible) prima facie presumption of such support — verses I adduced only in response to James’ self-description of being a biblical theist? I made no “mistake” in suggesting that presumption, regardless of its defeasibility. Your condescending and rude comment to the contrary notwithstanding, I do know how blogs work, as I have three of them and block comments on one of them just to avoid interminable entanglements with tar babies like you. I told you I was restricting my interaction on panentheism to James’ replies coincidentally, after your alleged “correction.” My correcting you each time in order to further expose your boorishness does not contradict that policy. Bill will have to live with your lower estimate of his powers of discernment. I am happy to have just noted James’ final comment, just posted. And this is mine. You may have the last word. Let’s wrap this up, gents. Tony, I’m not sure why you think I’m put out that you won’t discuss panentheism with me. I don’t think I’ve ever indicated that. What I’ve indicated is that since your claim of prima facie support for panentheism in Acts 17 has been refuted, it’s intellectually dishonest to pretend it hasn’t—regardless of whether the defeater came from your interlocuter or someone else. Btw, you say you think the verses in Acts 17 only support a prima facie presumption of panentheism. Either you are wrong, or you are defining prima facie so broadly as to make your claim completely uninteresting. If prima facie means “on an uninformed and unconsidered reading of an English translation”, then we can claim prima facie support for just about anything in Scripture—making such claims completely uninteresting. Why should we care, say, that an uninformed and unconsidered reading of Exodus 21:2 supports a presumption that the Bible condones slavery? On the other hand, if prima facie claims are interesting ones, such as claims about ostensible facts evident on first examination, then clearly you are in the wrong about Acts 17. I’m happy to have the last word, thank you. To understand anything you cannot be biased. need to delete everything and understand. everything visible and everything invisible…. Before anything was created, he existed, and he holds all things in unity. …the heaven and heaven of heavens cannot contain him. simply stated you can bring up a thousand arguements to reject panentheism but it is the only belief that you will find in each religion and satisfies science as in astrophysics (the theory of big bang). About God being absolute good as you say or mixed evil and good. A final point about panentheism worth consideration is the fact that being a holistic philosophy it refutes the notion of objective evil. What is deemed evil is simply a product of human subjectivity. As the renowned 20th century Unitarian theologian, Alfred Hall, remarked: “All that we mean or can mean when we say a thing is evil, is that it falls below our standard or idea of good.” The inference of this opinion is that human imperfection is but a stage both in the evolution of our species and, in a wider context, the unfolding of the cosmos. God does not need to be classified as good or evil to be God. He is God no matter what. I am brand new to this site and I admit that I didn’t read through the many pages of dialoque. However, I don’t understand why the panentheistic argument seems to be set on a biblical basis. While the ancients who wrote the bible were obviously very smart people, they did not have the scientific knowledge that we do today. As a geoscientist, I feel there is little basis for biblical arguments regarding the nature of a deity. It was only by discarding any Christian beliefs that I was able to connect the universe, nature, science, and all things into my acceptance of panentheism. It has absolutely no necessary connection to literature written thousands of years ago.